Brantford – Gaming enthusiasts from 22 countries will gather in Budapest, Hungary on March 25 to test their wit and skill in the first-ever escape room world championships, presented by Red Bull Mind Gamers. As the competitors race against time to successfully complete the challenges in the escape room, titled Mission: Unlock Enoch, they’ll wrestle with riddles, clues, puzzles and problems designed to perplex by a team from Wilfrid Laurier University’s Brantford campus. Scott Nicholson, professor and program coordinator at Laurier’s Game Design and Development program, and three of his students spent the summer of 2016 in the BGNLab (Brantford Games Network Lab) modelling and testing every element of the Unlock Enoch escape rooms. 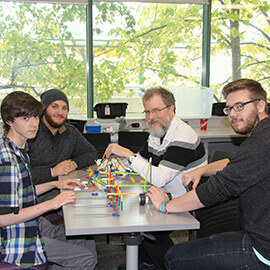 The students — Robert Durant, Sean Harrison and Chris Tenuta — are undergraduates in Laurier’s Game Design and Development program. The story behind Mission: Unlock Enoch is inspired by MindGamers, a feature film slated for release in March of 2017. In this sci-fi movie, a group of students discovers a wireless neural network, connected via a quantum computer, capable of linking all minds and of using one person’s mind to control another’s body. Players in Budapest will immerse themselves in the world of MindGamers, and the quantum-computing theme will be woven through some of the challenges. Red Bull, the event’s official sponsor, mounted more than 75 prequalifying events for Mission: Unlock Enoch. In total, more than 9,000 gaming enthusiasts attempted to earn a spot in the finals. The semi-finals will take place on March 23 and 24, with teams of four representing Austria, Azerbaijan, Estonia, France, Germany, Hungary, Italy, Lithuania, Oman, Norway, Romania, Russia, Singapore, South Korea, Slovenia, Spain, Sweden, Switzerland, Turkey, Ukraine, United Kingdom, and the USA. The top two teams will face off for the championship, which be streamed live on March 25 on Red Bull TV. During their design work, the Laurier team built physical prototypes for many of the challenges and also turned to digital tools to test their ideas. Once tested and finalized, the designs and prototype models were sent to a development team in Europe, which constructed the sets for the event in Budapest. Aspects of the design process were captured by videographers in Brantford to create video blogs, which will be posted online in the weeks leading up to the event. The videos can be found on the Brantford Games Network blog. Nicholson will be flying to Budapest for the championships, and will be providing colour commentary during the broadcast. A viewing party is planned at the BGNLab so that the campus community can watch live as the competitors tackle the challenges designed by the team at Laurier on March 25 at 3 p.m.